The latest round of Social Business House Bowls finished on March the 20th with the team “Looking 4 Direction” coming out on top. Alan Lichtwark, Bruce Hunter, Paul Heath, Des Glass and Murray Powell. I hope that you all enjoyed our new carpet. You christened it as the club has not yet played on it!! With the season drawing to a close we have completed the round robin and only have finals night to play next Wednesday. Well done to you all, some great bowls played and some great camaraderie. 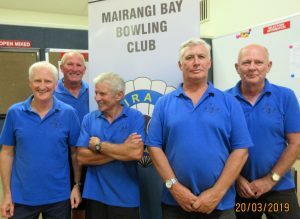 CB’s have now made up a team with thanks to Looking 4 Direction so we have 20 teams on finals night. The top 4 play for the championship; 1st plays 4th and 2nd plays 3rd , then winners play winners for the championship and losers play off for 3rd and 4th place. The next 8 teams play for the Bowl (random draw) and the final 8 play for the Plate (random draw). It’s tough as you start out but believe me you do get better with practice. Please remember $40 per team i.e. $10 per player payable on finals night. We look forward to a great night and as I was reminded tonight not just sausages & onions but fruit salad and ice cream as well next week! See you all same time same place next Wednesday.